Most people don't realize you can smoke a tuna steak for a delicious and healthy meal. Most people just simply grill a tuna steak but smoking it provides a unique spin on this gourmet dish. This isn't your typical canned tuna either. In fact, Ahi tuna steaks can cost about as much as a fillet Mignon beef steak at gourmet restaurants in the United States. This smoked tuna steak recipe has an Asian flare that was inspired by a recipe from a Japanese steakhouse. This smoked tuna recipe has the potential to turn even your most skeptical guests into tuna steak believers. Make sure you follow the step by step instructions in order for the tuna to turn out tender and not dry out out during the smoking process. Soak your cedar plank and wood chips in water for an hour. This will help preserve your cedar plank because the water saturation will make it less likely to brown or burn by the heat of the smoker. This will also impart some moisture to provide a sweet and smoky flavor in the smoker to help keep your smoked tuna steaks moist and flavorful. Next, combine your garlic and herb seasoning with the lemon juice and rub into both sides of each tuna steak fillets. You can even do this a few hours ahead of time to help all of the seasoning marinate into the tuna steak and provide some extra flavor. Light your charcoal smoker approximately 30 minutes before you want to put your cedar plank tuna steaks on. Spoon 1 tablespoon of soy sauce, teriyaki sauce, and sesame seeds on each side of the 2 tuna steaks. Set your tuna steaks directly on the soaked cedar plank. Form your frozen spinach into 10 individual balls and set them on the outside of the cedar plank. 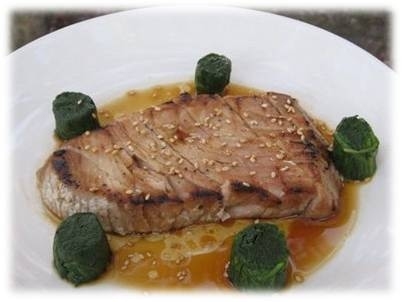 Place your cedar planks with the tuna steaks and spinach balls on them directly on your smoker. Smoking time is about 1 hour to 1 1/2 hours total. This recipe cooks very quickly compared to smoking whole meats or fish. If you like your tuna steak a little more rare, you can always pull it off before it is completely done. Don't smoke longer than 1 1/2 hours or you run the risk of your tuna drying out on the grill and becoming tough.